This is our review of the Loom and Leaf mattress, a recent entrant into the memory foam mattress market from mattress company Saatva. They are already making a big impact with their high quality memory foam mattress and direct-to-home delivery and installation model that is taking on the heavyweights in the industry. Loom and Leaf has been one of our top memory foam mattress choices and one of our highest rated beds last year as well as now headed into 2019. Hopefully this Loom and Leaf review will help you decide if it is the right choice for you! 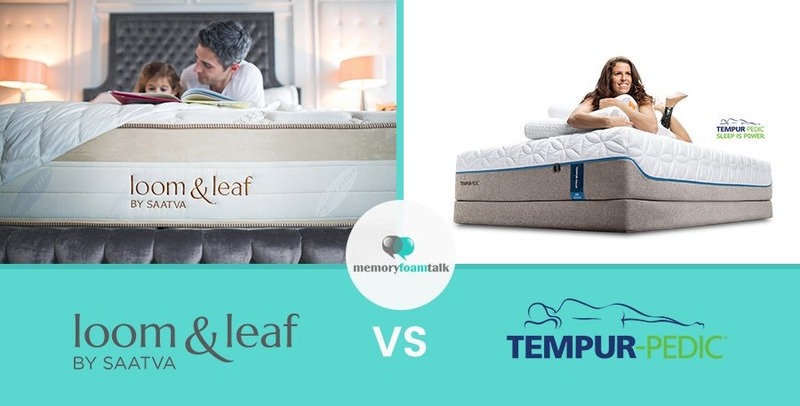 In a Loom and Leaf vs Tempur Pedic comparison we feel the Loom and Leaf is the best memory foam mattress hands down between these two choices. Loom and Leaf was started by mattress company Saatva, who sells innerspring mattresses exclusively online that get very good reviews and at an attractive price. Loom and Leaf is their new memory foam mattress brand. Saatva is known for their excellent customer service and quality, and they are now bringing this to the memory foam market. The company is also behind the luxury Zenhaven latex mattress bed as well. The Loom and Leaf direct mattress delivery and setup model is different than all the other “Bed in a Box” type memory foam mattresses. Because of this, they have included higher quality materials that compete with mattresses 3-4x the cost such as Tempur pedic. This is our personal favorite mattress currently, and we have tried both of their models – the Relaxed Firm as well as the Firm model. The Loom and Leaf mattress uses a variety of different foam layers in its construction as well as a unique cooling gel layer on top and a very high quality tufted cover that is much different from other memory foam mattresses. When we first received our Loom and Leaf we were impressed with the high quality materials and luxury feel to the mattress, as well as the unique aspect of not having to come out of a box upon delivery. 2″ Top Cooling and Comfort Layer – 2″ 4lb gel memory foam using a patented gel-on-gel swirl design and convoluted foam laminated to medical grade cooling gel which provides a cool, supportive sleep environment and promotes air flow furthering cooling. The type of gel used is medical grade which is usually found in hospital burn units for maximum cooling. 2″ Transition Layer – 2″ transition loft pad, which is a transfer layer between the base support layer and layers above which allows for better support and comfort overall. 5.5″ Bottom Foundation Layer – 5.5″ high density foam core base which acts as the foundation and support for the rest of the mattress. The cover of the Loom and Leaf is made up of a very luxurious feeling organic cotton circular knit top which is quilted with a 5/8” foam layer and a natural thistle flame retardant. We were quite impressed with the quality of the cover, as it is vastly different from the normal thin covers most memory foam mattresses utilize. All in all, the construction and materials used in the Loom and Leaf mattress are very high quality and typical of those found in much higher end memory foam mattresses such as Tempur Pedic. This differs from most of the other Bed in a Box type memory foam beds on the market which often use much cheaper materials. Loom and Leaf offer two models with different degrees of firmness, the Loom and Leaf Relaxed Firm, and the Loom and Leaf Firm. We have slept on both models, starting with the Relaxed Firm which we slept on for a month, then the Firm. 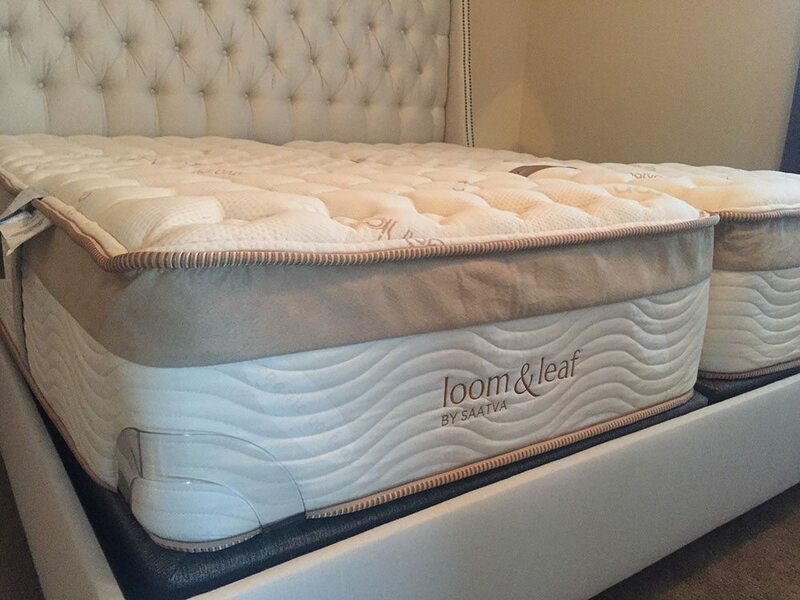 This Loom and Leaf review is based on our experiences with both firmness options, in both queen sizes as well as a split king mattress on the new Saatva Lineal adjustable base. The firmness on the Loom and Leaf Relaxed Firm is around a 5 out of 10 (10 being most firm). We felt the Relaxed Firm was softer than we expected, but that also has something to do with our combined weight and degree of sinkage into the mattress (Andrew is around 230 lbs, Kaye about half that!). We switched to the Loom and Leaf Firm mattress to reduce the sinkage we were experiencing as a couple and prevent Kaye from rolling towards me as my weight significantly caused me to compress the mattress. The Firm is more of an 8 out of 10 (10 being firmest), and eliminated this problem. Loom and Leaf actually recommends the Firm for couples such as us, so this may be something to take into consideration if you are like us. Having different firmness choices is a great option, as most memory foam mattress companies selling online tend to just offer one model based on the “universal comfort” idea that one firmness will appeal to the majority of sleepers. Even better is the ability to have both firmness options on one mattress, if you prefer, which you have the ability to do using the split king model as shown in the photo above. We received an adjustable Lineal base from Saatva, with 2 twin xl mattresses which can be adjustable independently on each of our sides, which solved many of the issues we initially had with the Loom & Leaf as a couple. The Lineal base allows you to raise or lower your own mattress independent from your partner if you set it up this way, and you can even have a Relaxed Firm model on one side, and a Firm on the other if you so desire. As a couple, we have found that having different choices of firmness is much better to ensure optimal sleeping conditions, and the Loom and Leaf firmness options put them more on par with offerings from the higher end mattress manufacturers. The Loom and Leaf mattress is very comfortable, which you feel as soon as you lie on the tufted quilted cotton cover that includes a 5/8″ foam layer. The 6.5 inches of specialty foams and the exclusive gel cooling layer are pretty much unrivaled in the industry. Overall, the mattress comes in at over 12″ which is thicker than most competing memory foam mattresses as even the cover has 5/8″ of foam sewn inside of it. Most memory foam mattresses on the market, especially ones at this price point, are made up of 3-4″ of specialty foam such as memory foam, latex, Avena, etc.. placed on a support foam base. These can be compressed and shipped in a box, whereas the higher quality materials of a Loom and Leaf memory foam mattress cannot. When you first lay down on the Loom and Leaf mattress there was an immediate softness due to that quilted cover with the foam layer. Immediately after, the support layers begin to sense your pressure and react accordingly. The feel is very balanced. 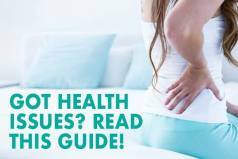 It doesn’t excessively hug your body, but there is a nice degree of body contouring and overall comfort on par with much more expensive mattresses on the market. This configuration solved a lot of our issues with movement and sinkage – and this way allows each of us to adjust our mattress up and down as required, and each having their own side with NO motion transfer. The Lineal and split king option is a great choice for couples who may require different firmness options or their own adjustability. Sleeping Hot on the Loom and Leaf – No! Sleeping hot is often a factor with many memory foam mattresses, but not the Loom and Leaf mattress. Right from the start of our review of this mattress we felt it was cool and did not wake up sweaty or hot. As we discussed above, the exclusive cooling gel used in the top layer makes a HUGE difference in terms of keeping you cool at night. The patented medical grade cooling technology that the company uses in their mattress is unrivaled in the online memory foam mattress market, with Loom and Leaf the only one providing it. Trust us, it makes a huge difference. There has not been one time either of us felt hot or sticky on the mattress at any time. Loom and Leaf really got this right. Sinkage and motion transfer on the Loom and Leaf for us depends on the model that you select (Relaxed Firm vs. Firm), as well as how much you weigh. The Relaxed Firm was much softer for us and due to our combined weight (around 350 lbs together), caused more sinkage relative to the Firm model which we replaced it with. As mentioned, this is primarily due to me weighing twice what Kaye does, and thus the weight differential making Kaye “roll” towards me at night. Edge support was good on the Relaxed Firm when I sat on the edge, but again – due to my physical size the mattress sunk down much more for me than when Kaye did the same, as she weighs half what I do. It really just depends on how much you weigh, as someone like me will cause much more sinkage and compression on the mattress than a lighter person. Something to take into consideration as a couple or larger person. There was minimal motion transfer on either model we used, with the high quality foam doing a great job of insulating movement by either of us at night when turning or adjusting in our sleep. The Firm provided much less motion transfer due to the denser foam construction, naturally. As mentioned, with our updated 2019 testing of the Loom and Leaf with the Lineal adjustable base – having our own independent side that is adjustable for each of us completely eliminated ANY motion transfer which is a great option. Off-gassing is non-existent with the Loom and Leaf mattress. Off-gassing is a by-product of the chemicals used in the foam that create a sour odor when compressed and put in a bag and then a box for shipping and then opened at home. Loom and Leaf avoids this by shipping their mattress uncompressed in its natural form which is delivered to your doorstep and installed by professionals in your home. They are one of the only online memory foam mattress companies which does this currently, which makes a big difference. In addition, the Loom and Leaf mattress is comprised of American-made, plant-based foams that have excellent sustainable qualities. The outer covering is hand-crafted with organic cotton and possesses a natural thistle flame retardant. The company itself is committed to a smaller carbon footprint and are members of the Sustainable Furnishings Council (SFC). Needless to say, no smelly chemical odor was present with either of our beds which we received. Customer service is something that Loom and Leaf prides itself on, and it is evident during both the ordering process as well as the exchange process which we were able to experience. Their parent company, Saatva, is known for customer service and this extends to the Loom and Leaf brand. Once you select the size and model of bed (Relaxed Firm vs. Firm) and place your order, within 24 hours you receive a call confirming it and letting you know the expected delivery date. The company representatives are extremely friendly and walk you through the entire process, which for us was around 10 days. The mattress is built to order then delivery is arranged via a local delivery company who calls you the day before delivery is scheduled and then on the same day within an hour of delivery. The guys that delivered our beds took away our older mattress and brought in the Loom and Leaf one and unwrapped and installed it in our room quickly and professionally. Every person involved was extremely friendly and helpful, and the entire ordering process (as well as the exchange we made for a Firm model) went super smoothly. High marks in this category. We were quite surprised at the price of the Loom and Leaf memory foam mattresses due to the exceptional quality of materials used and the direct-to-home shipping and installation. For an online mattress company to offer this type of quality at $1299 (for a queen mattress) is quite rare. The company really competes against in-store high end memory foam mattresses that cost $3-4000. Both Kaye and myself previously have owned expensive >$4000 models from Tempur Pedic and Comforpedic. After sleeping on the Loom and Leaf for our reviews over a period of 2 years, and as our personal favorite mattress, we feel the materials and construction of the Loom and Leaf surpasses these expensive store mattresses by far. All in all, we love our Loom and Leaf memory foam mattress. As we have said before, we have had mattresses costing 3-4x what the this one sells for, and we like it much better. In the three years we have reviewed mattresses, Loom and Leaf has been at the top of our list. The high quality materials including exclusive features such as the medical grade gel cooling layer, the in-home delivery and installation, and the excellent customer service – all for around $1300 – can’t be beat. If you are looking for an alternative to in-store memory foam mattresses such as Tempur-Pedic or similar more expensive in-store memory foam beds, we highly recommend you consider Loom & Leaf instead. If you are looking at cheaper, Bed in a Box type beds, you should also consider that for around the same price you can get much better quality and value from a Loom and Leaf. We have had the ability to sleep on the Loom & Leaf since we started Memory Foam Talk, and we were sent updated models to test recently and can say they continue their high quality craftsmanship and design and the bed really holds up to long term sleeping. The Loom and Leaf mattress is a luxury mattress priced at a fraction of what you’d pay for one in-store. It is crafted with some of the highest quality materials, has great support, looks and feels gorgeous, and has a comfort and cooling feel that is difficult (if not impossible) to beat at this price point. All things considered, we feel that this is a great mattress that offers a lot of value for your money and really head and shoulders above most online mattresses on the market today. We hope that this updated review of the Loom and Leaf mattress helps you out in your next purchase decision! If you have any questions, feel free to comment below or contact us directly. Read the full Loom and Leaf vs. Leesa review. 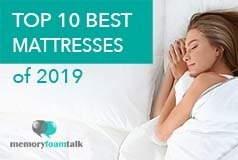 In this review, we’ll be comparing two all memory foam mattresses: Loom and Leaf and Tempur Pedic, coming from two well-known mattress manufacturers Saatva and industry heavyweight Tempur-Sealy. Read our full Loom and Leaf vs Tempur Pedic comparison. 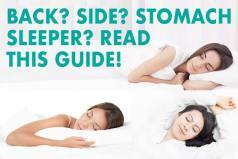 Click here for more Loom and Leaf mattress comparisons.